Mindful Health is a not for profit organisation delivering high quality Mindfulness Consultancy, *Mindfulness Teacher Training, and Mindfulness-based courses. Its senior Mindfulness trainers work within the Centre for Mindfulness Research and Practice (CMRP) University of Bangor and also with Sussex Partnership NHS Trust within the Sussex Mindfulness Centre (SMC). 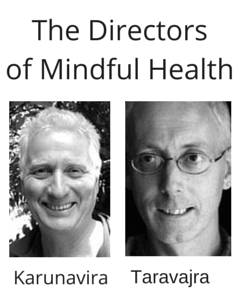 Mindful Health is a member of the UK Network of Mindfulness-based Teacher Training Organisations. Our Mindfulness Trainers adhere to the *Good Practice Guidelines for Trainers and we encourage teachers we train to adhere to these guidelines. Mindful health offers consultancy to organisations and businesses wishing to develop Mindfulness services and training in the U.K and internationally. We train groups and individuals within an internship focused approach. We provide Mindfulness Supervision and coaching at individual, group and organisation levels.